What do you think he is holding in his hand? Not gloves and not a cane? Booth was a Mason, as was brother, Ned. I think he has one glove on the hand on the right side (his left) and is holding the second glove in the same hand. I would tend to agree, Tracy. Though the object looks a bit lighter than the glove he is wearing, it could be that we are seeing the inner lining of the glove or perhaps there is a lighter stripe around the glove’s opening. a great photo. Ever-so-slightly and masterfully highlighted by either the photographer or an expert of the day. What a fascinating face, knowing what he would do. My favorite Booth Photo – well done, Dave! And yes, Richard that photo does appear to be retouched in some manner – very skilfully done! I am a little miffed at your selection of Lewis Payne as your id photo…for that matter, some of the posts on this site are troubling to me because while I can clearly understand the intent on learning more history at any chance, some of the posts give me pause to wonder about the motivation behind them. I do enjoy reading most of this stuff anyway, and much of it is rather informative and others not so much. Can anyone help me understand my cognitive dissonance I get from this site? As the great assassination expert James O. Hall would say, “You have not yet been bitten by the bug. Once infected, there is no known cure.” My interest came from family history and the possibility that my great-grandfather was involved in a minor way in the conspiracy. I also enjoy a good murder mystery — and this is one of the best around and based on an actual event. I have dealt with many good and knowledgeable people in my 50+ years in this field. I have also dealt with some “unusual characters.” With few exceptions, they have all been people that I would welcome at my dinner table. I actually cannot say the same for many in positions of power (or those who want to be) today. I’ll stay with the bunch who are trying to keep at least one segment of our history alive so that others may learn from it. George, Don’t try to find hidden meanings. Just take it at face value. As historians we only want to uncover the truths that our modern society wishes to forget. After studying the photo at great enlargement, I agree, that his Left hand looks like he is holding the other leather glove. It looks as though the opening of the glove has been turned back about an inch, and you can see a small portion of the lining. The left hand and glove appear elegant compared to the exposed right hand. Note the width of his right hand. Note the width of his right forefinger. Now compare these measurements with his left hand. The width of his right hand his big enough to cover his face from his eyes to the middle of his chin. Note also the right hand cuff on his coat and compare to his left cuff. Note the right sleeve cuff has a sewn cuff but the left sleeve appears to have no corresponding seam. The size of the right cuff is a size and a half wider than the left cuff. Check it out. Perhaps it’s just perspective and shadow. Perhaps an expert on photography can explain it better. My opinion is that you are looking at a photograph taken over 150 years ago by an instrument of that day and time. It has been reproduced many, many time; and is now being subjected to a computer image with its many intricacies. Therefore, you have distortions. I can see the cuff on the coat sleeve that is in a straight position; I can also see that it is covering the cuff of his shirt. Whereas, the other sleeve is bent and drawing the material up so that the cuff is exposed. 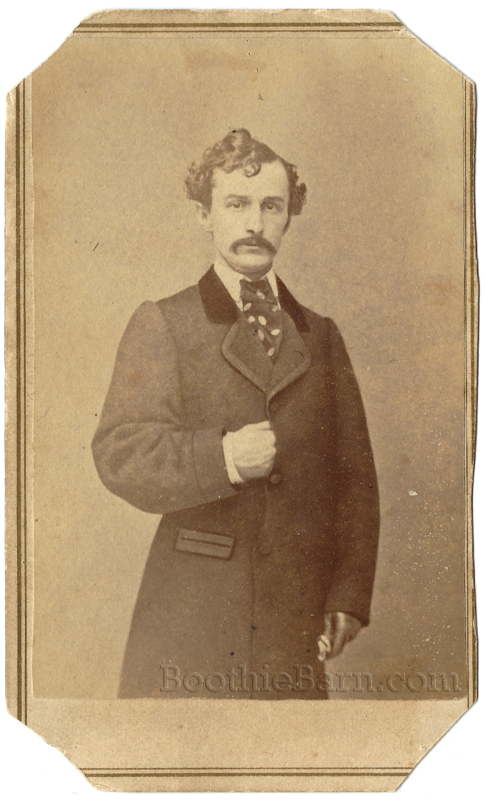 As for the size of Booth’s hands, we had a similar problem when seeing the last photo taken of Mary Surratt before her ordeal began. She, too, is holding what is probably a glove in a gloved hand that appears to be deformed. The ungloved hand also appears rather large for a woman. Again, I think it’s the games that cameras can play. Thank you for commenting on my post Laurie Verge. I believe this photograph of Booth was taken by the Scottish man – Alexander Gardner who once worked for Brady. At one stage he worked for the Pinkerton Detective Agency and then for the War Department. He was given the rank of Captain I believe. If you look at the famous Pinkerton/Gardner picture of Lincoln outside a field tent you will see Pinkerton (left) with Abraham Lincoln and Major General John A. McClernand – bearded (right). These two officers beside Lincoln have the same pose, hand on heart expressing patriotism, or whatever it might portray in the case of Booth. Napoleon and Nelson have also struck this classical pose. This was no doubt arranged at the suggestion of the photographer. And there are studio shots of General George McClellan in this same pose.The right hand inside the tunic – classical style. This was earlier in the war possibly at Antietam in 1862 before Grant was promoted over McLellan. There is a striking resemblance in Pinkerton’s right hand to that of Booth’s shown here. Both of them have a bulging vein structure with a similar pattern, in this same pose. Pinkerton was born in Glasgow. Having watched newspaper photographers ask subjects to do perfectly ridiculous things over years of newspaper interviews, I just thought, as Jim said, Booth was posing as the photog suggested,aping Napoleon’s best-kiown portrait. Kathy Canavan: Yes I agree. The media portray images of what can give the greatest impression and effective influence. And images can be doctored easily – especially nowadays. The hand-in-waistcoat (also referred to as hand-inside-vest, hand-in-jacket, hand-held-in, or hidden hand) was a gesture commonly found in portraiture during the 18th and 19th centuries. The pose appeared by the 1750s to indicate leadership in a calm and firm manner. The pose is most often associated with Napoleon I of France due to its use in several portraits made by his artist, Jacques-Louis David, amongst them the 1812 painting Napoleon in His Study. The pose, thought of as being stately, was copied by other portrait painters across Europe and America. The majority of paintings and photographs show the right hand inserted into the waistcoat/jacket but some sitters appear with the left hand inserted. The pose was also frequently seen in mid-nineteenth century photography. With the invention of photography, the pose continued but may have had an additional purpose in preventing blurring by maintaining the sitter’s hand in a single place. The pose is commonly seen in photographs of members of the military, with a number of American Civil War photographs showing the pose (or indicated by three open buttons on a sitter’s tunic). I also remember distinguished gentlemen of the 20th century (even in my hometown) standing and talking with their one hand grasping the opposite lapel of their suit jacket. This happened whether or not they were posing for a photograph or delivering a lecture. It seemed to be a habit. No. It is a Masonic hand sign. Masonic hand signals are supposed to be secret, but this is believed to be the Sign of the Master of the Second Veil of the Royal Arch Degree, and all of it is tied to Exodus and God speaking to Moses. Both the Scottish Rites and the York Rites use it, but I think it is a quick, in-out gesture. Since many people are fascinated with secret signs, Illuminati, etc. today, this sign may have become one of those “sinister” ones to watch out for! I come from a line of Masons, and I really don’t think that they would ever pass secret signs in public, much less pose for portraits and photos displaying one. Stalin posed with his hand inside his military coats. Somehow, I doubt that he was a Mason. If Booth was indeed displaying a Masonic sign, that would debunk some people’s thoughts that he converted to Catholicism. So far as I know, throughout history, Masons and Catholics are like oil and water. As of ducks that die in tempests. Moved, because he couldn’t help it. Too bad the cartoon would not transfer with the words. It shows an elderly, distinguished gent of the late-19th century posed as described – and then flubbing the whole photo by moving. He needed one of those body stands that early photographers used to keep their subjects still during a somewhat lengthy pose. Booth never seemed to need such assistance. Masons perform “secret signs” before the public all the time. It’s to their allegance, to their brotherhood. My favorite Booth, Edwin, was also a Mason. He also does this sign in a few of his photos. It made me sick, because I’d had great admiration for him. But, go. Locate the pictures for yourself. Do not take my word for it. As well, one of my great grandfathers was a freemason. My father and three uncles were Masons in the 20th century, and I can be assured that they were not members of a conspiratorial secret society that went around flashing signs of their rituals in public. Have you seen Masons performing their secret signs in public? I belonged to a sorority in college, and we had rituals and secret signs and handshakes, but woe be to a member who used them in public. There were definitely other secret societies in history who might have, especially as civil discord grew nearer in the 1850s, but I’m going to go with the historical reasoning behind the hand-in-waistcoat pose for right now. Alright, I understand. But check out about Edwin Booth, just for interest. Not everything is some BIG secret, although it is called the “secret hand,” and in the Masonic order it is known as the “Master of the Second Veil.” The Booth family makes for a very fascinating study, and it was the Cincinnati Masons, who paid for Junius Brutus Booth’s coffin after he died on the steamer. According to John Booth’s sister Asia he used to attend secret meetings of the ‘Know Nothing Society’ which along with the ‘Free Soil Party’ (‘Free Soil, Free Speech, Free Labor and Free Men) were movements loosely tied in with Republicanism. Ref: ‘The Unlocked Book’. The ‘Know Nothings’ were Anti – immigration particularly in regards to the massive influx of Irish and German citizens. They were middle class in the main and divided over the issue of slavery.They were basically Protestant and Anti- Catholic ie White Anglo -Saxon Protestants and anti Papist founded in 1845 by Lewis Charles Levin. — James M. McPherson, Battle Cry of Freedom, p. 131. Substitute some different immigrant groups and cities with similar problems in 2016, and it sort of sounds like modern times, doesn’t it? A reference here to the wealthy Major Henry Rathbone who married Clara Harris daughter of Ira Harris – one of the Senators who proposed the Ironclad Oath. The Major became a US Consular General in Hanover in 1882. He allegedly attempted to kill his children but Clara saved them. He killed her supposedly with a pistol and knife. He was put away for life in an Insane Assylum in Hildesheim. It is said he had delusions of people in the walls but lived a long life. It is truly a tragic history about Henry and Clara. Wish he could have gotten over the trauma. Julie Witt :Your so kind but Clara saved her children and died in their place.Trauma does not justify murder and I’m being kind also. We have also learned over the past few years that Rathbone did not serve as US Consular General in Hanover, Germany. when you compare this photo with the one of him onstage in NYC, with his brothers, this really IS a poor likeness. Doesnt even look likek the same man. When you get the right image, he really was very attractive, but most of the photos look like this — sorry to say, but kinda like a rat faced little git (monty python thing i think Evidently the man was not overly photogenic. This is unrelated, but i enjoy your site so much; hugely. THanks for sharing all of this wonderful stuff.